This is concept art for what exactly? A new map? Or just ideas from times long past that will never materialize? Probably the latter. The Gallente with hte Precision Rifle was made by William Chen and he's no longer a part of CCP games. More like concept art demonstrating the atmosphere and lore of New Eden and it's various factions. So you can make art but you can't port Dust to PS4. If I had known better I would say CCP is stalling. It's not 'concept' art. It's art. 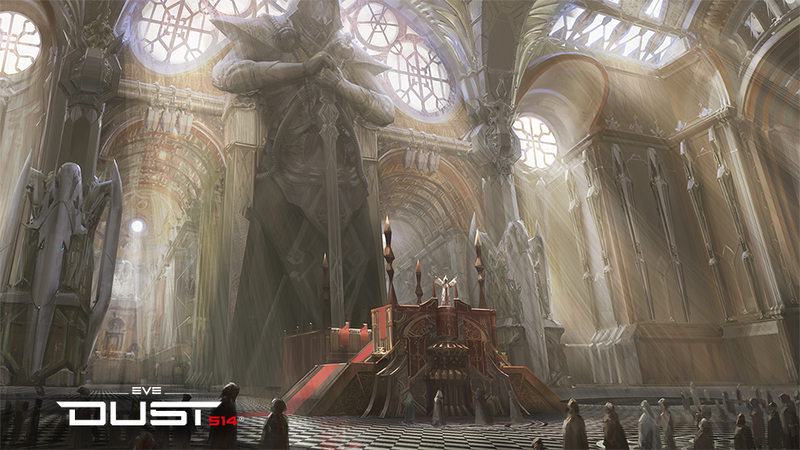 Particularly artwork depicting an amarrian religious rite. Concept art deals with y'know, concepts - like a piece of concept art for a map or a structure. This isn't concept art. When we can do full scale assault here? Amarr need to be stoped. Awwwww...... I mean its fantastic art......but I've seen it before. Believe it's in EVE; Source. Was so pumped but I've already seen this in one of those picture books y'all had for sale. I'm not sure to be happy or worried about these new concept wallpapers. It either means Dust/Legion is going forward or they are cleaning out their desks and finding these. Not really new when we've seen this before. More Like Refurbished picture we dug up and selling at full price. I bet that preacher is saying " alright hoes get your Ak.0 Amrr Proto with armor plates, Viziam Scrambler, Viziam Pistol, and Nano hive, and the Cor Locus grenade to attack the Minmatar Scum." LASERS ***** ('*-_-*) E>------ !!!! "Not so pretty now, amarrian scum." Then we send in the slaves to clean it all up. So you in the end you just end up looking like a **** for making their assimilation that much harder. So what we getting next, Gal Surrendering? We got Cal, Min, Amarr, so yeah Gal surrendering to Cal should be the next wallpaper. If you scared go to church.